The parent group is a voluntary group of parents/caregivers who contribute to the mission of the nursery school. We utilize the many wonderful skills and talents of our parents to create memorable events for our entire school community of students, parents, and staff. Order through this link and MHNS will earn credits for new books! 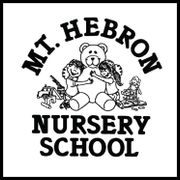 MHPC is a small, family-oriented church located in the heart of the Mount Hebron community. Our 150-member congregation is very active, and we welcome you to join us any Sunday. Worship, tradition, service, mission, and fellowship: it's what we're all about! For children going to school for the first time, NAEYC, National Association for the Education of Young Children, has created a video to help children visualize what it might look like for them as they start this new chapter in their lives. Parents have an opportunity to watch the video with their children, then talk about what will happen in their own homes and brainstorm any first day anxieties and problem solve any needs for the new routine. Healthy Beginnings is a resource to help you nurture the tremendous potential for learning and growth that every child hasâ?¦ that every child is born with. Specifically designed for caregivers of infants and toddlers from birth through age three, Healthy Beginnings gives you knowledge and support around child care and child development, while our Activity Planner provides you with fun, developmentally appropriate activities that build young childrenâ? ?s skills and promote all kinds of learning. Important information for parents of children in child care facilities. A publication of the Maryland State Department of Education Division of Early Childhood Development - Office of Child Care. Pamphlet includes information about the requirements that State-regulated family child care homes and child care centers must meet; Your rights and responsibilities as the parent of a child in regulated care; How and where to file a complaint if you believe your child care provider has violated State child care licensing regulations. The Howard County Parents as Teachers (PAT) program supports a parent's role in promoting school readiness and healthy development. PAT is a voluntary home visiting program for Howard County residents. Ready At Five is a small organization with a big mission. Founded in 1992 in response to the first National Education Goal: "All children will enter school ready to learn," we are dedicated to elevating school readiness for all Maryland children. Learn more about the ASQ here! An early initiative supported by the Howard County Early Childhood Advisory Council. Playing is one of the most important activities young children do. When children play they are able to create, explore and begin to develop their imagination. When children play in groups, they begin to develop negotiation skills and learn to resolve conflicts. For children, playtime is work time! Let's Play, is a parenting app for on-the-go families. From the daily comute, to bed and bath time, this app proposes learning opportunities for young children to engage in while their families move through their daily routine. The bilingual (English/Spanish) PBS Parents Play and Learn is a collection of interactive games that are fun and educational for parents to play with their young children when they are at the store, the zoo, or other familiar locations.